Have you made up your travel plans for 2017? Well, you should have you travel list now! Several airlines are now offering seat sale for 2017!!! For example, here is a new set of Cebu Pacific promo fare 2017 for domestic and international destinations. Sale tickets are as low as P1,499 for local trips from Manila. Included in the promo are destinations like Bacolod, Boracay (via Kalibo), Cebu, Tacloban and several other places. 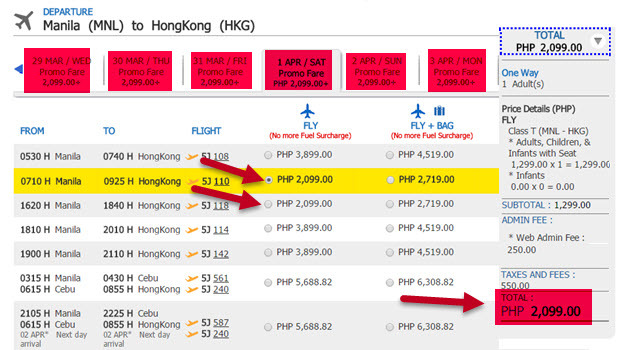 As for international flight sale, Hongkong, Macau, Singapore trips are as low as P2,099 ALL IN for one way trip. Fly to Busan, Bali or Kuala Lumpur for only P2,799. The current Cebu Pacific promo is best for February, March, April 2017 travel. Need help in planning your trips? Check the 2017 List of holidays and long weekends in the Philippines. Check this sample ticket booking we got thru online booking for domestic route, Manila to Boracay. 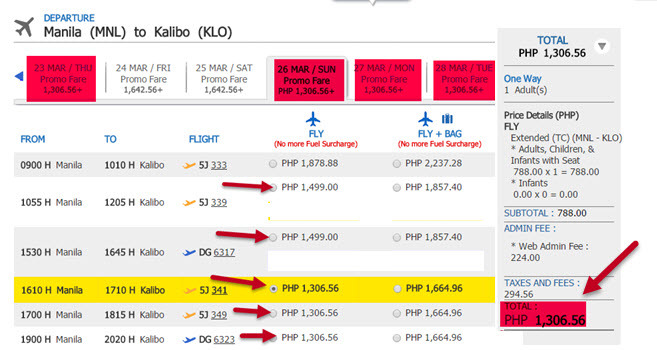 Based on the promo, the Manila to Kalibo sale flights is as low as P1,499, however, we were able to obtain ticket that cost only P1,306.56 for this route. If you want to get the lowest fare, check on several dates before booking. Here is a sample ticket booking we got via online booking for Manila to Hongkong travel promo 2017. Promo seats are limited, so, once you have identified your travel dates, book right away! 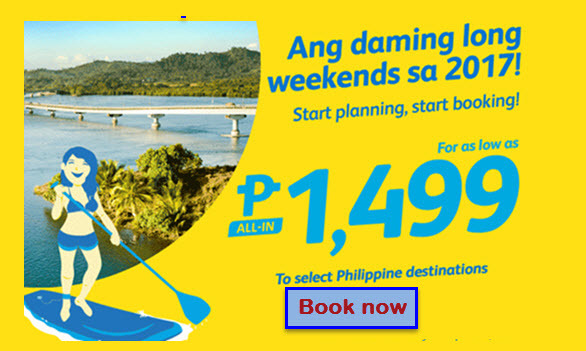 To secure the Cebu Pacific low fares fast, book online at www.cebupacificair.com. You may also purchase the cheap tickets at the airline ticketing offices and accredited travel agencies and booking offices. Another way of getting the promo ticket is by calling Cebu Pacific Air hotline at telephone numbers: (02) 702 0888 (Manila) or (032) 230 8888 (Cebu). Want to book online but need help? Check this ONLINE BOOKING GUIDE. The above promo fares are valid for travel in the next 3 months. This means you can book for your summer vacations or your Valentines getaways. When you are in Metro Manila, here is the List of Cebu Pacific Ticketing Offices in the area. The quoted fares of Cebu Pacific include the base fare, Web Admin Fee, taxes and fees and 7 kilos hand carry bag. Pre- purchase your Checked Baggage Allowance so you can save on checked baggage fees. During booking, you may also reserve your favorite seat or purchase hot meals during the flight. For those in the Visayas, check the List of Cebu Pacific ticket offices in the place. So, have you identified when you would like to fly? Book now! Sale tickets are limited and may not be available on all flights! We are on Facebook! For updates on promo fares, PISO FARES, travel tips, FOLLOW our FB: PISO FARE Ticket!! !